Turbo is a perfectly enjoyable and often funny animation film with a stellar cast behind it, but the predictable storyline and underwhelming 3D effects are a little disappointing. Co-written and directed by David Soren, Turbo is a 3D animation film about Turbo (Ryan Reynolds), a garden snail outcast obsessed with motor racing. Constantly feeling like he lets his over-cautious older brother, Chet (Paul Giamatti) and the rest of the snail community down, the small snail with big dreams sets off on an adventure one night, during which, he’s swept into the air intake valve of a huge sports car and swallows large amounts of nitrous oxide. This, in turn, changes Turbo’s body forever, allowing him to reach incredible speeds of 200 miles per hour. After showcasing his new speeds to the rest of the snail community, Turbo finds that fate intervenes again, when Tito (Michael Pena), a snail-racing obsessed, taco stand owner, captures Turbo and Chet and takes them back to his restaurant to race them against the other snails in his collection. But it isn’t long before Tito discovers Turbo’s incredible ability to reach high speeds and together, the two fight to compete in the Indy 500 against the egomaniac and racing superstar, Guy Gagné (Bill Hader). 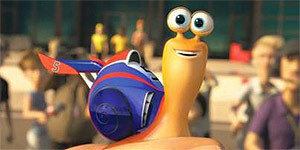 Turbo is a fun and enjoyable animation that will leave its target audience feeling more than satisfied. The jokes are often funny, there’s always something happening and each of the varied characters generally offer something worthwhile to the storyline. As well as this, Turbo himself is a likeable and sympathetic main character and it’s easy to root for him on his ambitious mission to become the Indy 500 champion. Finally, the impressive ensemble cast (Samuel L. Jackson, Maya Rudolph, Snoop Dogg and Richard Jenkins) generally work together well, and Ken Jeong, playing the feisty female elder, Kim Ly, delivers the film’s funniest lines perfectly. Unfortunately, Ryan Reynolds, with his distinctly manly voice, feels terribly miscast as Turbo, a timid snail that probably wouldn’t say boo to a goose, and the unique voices of Samuel L. Jackson and Richard Jenkins are disappointingly under-used. Finally, although expected, it’s a real shame that writers, Darren Lemke, Robert D. Siegel and Soren went for such a predictable plot (after the end of first act, you pretty much know what’s coming next) and for the most part, the 3D elements are rather forgettable. Turbo is expectedly predictable and bereft of any mind-blowing 3D effects, but the uplifting storyline and stellar cast generally make this fun animation film an enjoyable watch for the whole family.